Shares of cruise line stocks plunged in early trading yesterday after market leader Carnival Corporation (NYSE:CCL) reported fiscal second quarter 2018 earnings and full-year guidance that fell short of expectations. Shares fell as much as 10% in early trading on Monday and were down 8.8% at 10:50 a.m. EDT the same day. Competitors followed the drop with Norwegian Cruise Line Holdings Ltd (NYSE:NCLH) and Royal Caribbean Cruises Ltd (NYSE:RCL) falling as much as 6.5% and 5.1% respectively on Monday as well. Second quarter results weren't what investors were worried about yesterday. Revenue was up 10.4% to $4.36 billion and net income was up 48% to $561 million, or $0.78 per share. On the top line, revenue easily surpassed the $4.33 billion that analysts expected and even adjusted earnings, which pulls out one-time items, of $0.68 per share passed the $0.60 estimate. What concerned investors was that higher operating costs, fuel costs, and exchange rates are expected to eat up any potential growth in the fiscal third quarter. Guidance is for $2.25 to $2.29 per share in adjusted earnings, which compares to $2.29 in adjusted EPS a year ago and Wall Street's estimate for $2.48 in earnings. The reason Norwegian Cruise Line and Royal Caribbean have followed Carnival lower is because they'll face the same cost pressures as Carnival in upcoming quarters. Those cost pressures could hurt their bottom lines, something investors weren't yet pricing into the stock. To see why investors are concerned about costs, you don't need to look much further than the chart below. All three cruise line operators have seen margins expand since 2014 when oil prices fell and became a benefit to cruise line operators. The combination of lower fuel costs and higher prices for cruises was a boon to their businesses. 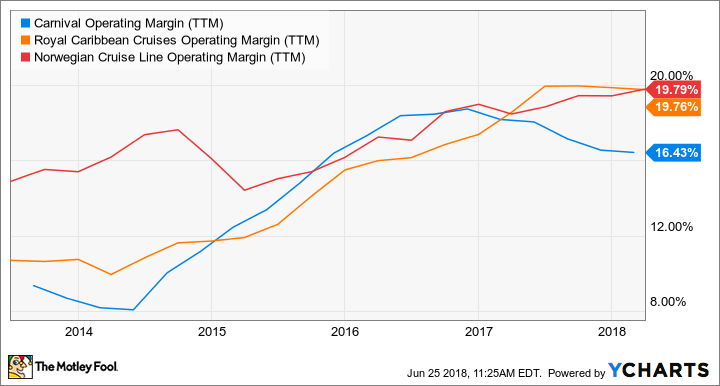 CCL Operating Margin (TTM) Data source: YCharts. We may be seeing some of these positive operating trends reverse course. Costs are clearly rising and Carnival is only expecting net revenue yields to be up 1.5% to 2.5%, not enough to offset a 3% to 4% increase in operating costs, much less rising fuel costs. The rest of the year might be tough for cruise line earnings and it wouldn't be surprising to see earnings sink if companies aren't able to raise prices even more than they already have been as the year goes on.